A hard working, sturdy pair of boots are going to be your best friend when you take your boys tromping through the countryside. 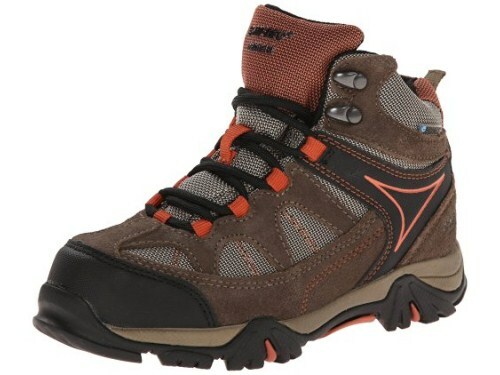 But hunting down the perfect pair of hiking boots for your micro mountaineer can be daunting. That is especially true when you realize proper, blister-combating boots could be the difference between reaching the peak or your kid throwing a fit and turning the whole hiking group running back to the car. You don’t want that, and we don’t want that. So we’ve reviewed the 6 best meltdown-proof boys' hiking boots that’ll keep your kiddo’s feet cool, dry and blister-free. So if your child does throw a tantrum, blame it on the those organic granola bars. **Below, you'll find our detailed reviews, but you can also click the links above to quickly check the prices of our top 3 picks for boys hiking boots in 2018. If your kid has always worn a pair of Timberlands or Keens and loved it, you might want to remain loyal to that brand, since most boot companies tend to use a consistent foot model over time, so the fit probably is akin to the last. If this isn't the case, you'll want to find your boy the sturdiest, comfiest boots you can. Though sometimes sturdiness comes at the price of comfort. The ankle shaft and auxiliary padding of each pair increase comfort and fend off rolled and scuffed ankles, but also restrict overall flexibility and movement. Rain, Snow, Sleet? That’s no problem if you buy the right boots for the job. Full leather hiking boots for boys tend to be ultra water resistant, while mesh and suede combos forfeit that extra protection for lightness and breathability. Fully synthetic boots are sometimes ready to wear right out of box and onto the trail, while leather boots require some measured and thorough breaking in. Additionally, extra strips of rubber on the outsole make boots more grippy for uneven terrain such as loose dirt and slick limestone. When shopping around for boots, it is good to remember that fit is quite literally the most important feature. Shop late or try on boots at the end of the day when children's feet are slightly swollen, like they will be after a day of hiking. Without a comfy fit at the get go, all that mesh tech and grippy insoles is purely decorative. Have your tiny adventurer slip into the unlaced boots and push their toes forward until they hit the end of the toe box. You should be able to slip about one finger between their heel and the back of the boot. Then lace up, and have your boy lightly kick the ground, toes first. Be sure his toes don’t bump the front of the boot. Then have him spin in circles, step up onto a bench, run around a bit and see if there is any unwanted heel lift. If your boy's toes or feet feel squished, the boot is too narrow and you’ll need to opt for a wider model. Even though your boy is probably a spider monkey, he's going to need some superior shoe traction to keep up with his death-defying jumps and ceaseless rock climbing. Grippy outsoles are made from either a formidable lug pattern (sticky rubber soles, deep grooves and bumps for traction) which is great for stomping through mud and clinging to slick granite. It also has a sizable heel break, which reduces the chance of sliding during steep climbs. You might be thinking “why should I take care of these boys hiking boots if my kid is just going to outgrow them in a year?” The answer is so you can create a hand-me down system that will minimize cost and ensure a comfortable fit for each child you have. If you only have one little sprout, then it is still worth your while to keep these boots in good shape because you could sell them or pass them onto cousins, schoolmates and so on. It’s always best to conserve and preserve right? That’s what the great outdoors is all about. But at the end of the day, we’re not advocating for more work for you, so get your little one involved in the boot care process so they get accustomed to those necessary but minor chores that let them have fun on the trails. If you aren’t experienced in youth hiking boot care, then I recommend checking out this video by Second Summit that details every trick and tip to keeping those kids hiking boots to last through your boy’s next growth spurt. But you’ve probably got a million tasks on your to do list, so I’ll give you a Spark Notes summary. After a long, messy hike, you should remove clumps of mud and dirt, remove the inner sole and laces and give all those components a proper scrub. Dampen the boots (sans laces, inner sole etc) then use leather, suede or mesh cleaner to scrub the entire boot and really get into those pesky seams. Rinse and dry, and stuff it all with bunches of newspaper so the boots retain their shape. But don’t be tempted to pop these in front of a radiator of fireplace to expedite the drying process! That just ends up aging them and cracking the material (major bummer). Then top off the boots with dry leather conditioner and wax every now and then. Wooh! Thanks for sticking with me through that crash course in boys' hiking boots, I think you’re ready to see our top picks. 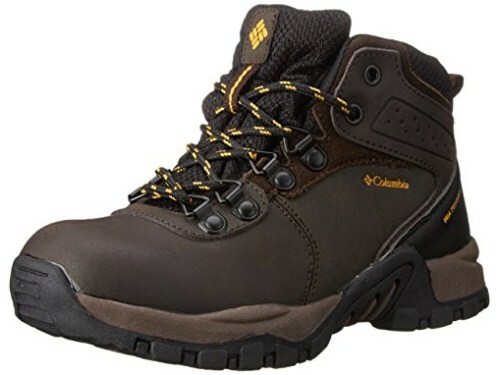 The Columbia Youth Newton Ridge Hiking Boot is a fully waterproof, lightweight adventure shoe. It is constructed with molded rubber bumpers and polyurethane coated leather with a gusseted tongue that keeps rain, mud and slush at bay. A comfy EVA padded footbed and cup sole construction make these a great introductory boot that will mold adeptly to rapidly growing feet. Additionally, the shaft measures at approximately 4" from the arch, which offers ample support for clumsy young trekkers with developing ankles. Then finally, the traditional lace up style makes it easy to keep those trip hazard laces locked into place mile after mile. Hi-Tec Altitude Lite I WP JR Hiking Boot integrates waterproof suede leather and mesh upper to provide ample durability, breathability and comfort. Additionally, the Dri-Tec waterproof, breathable membrane keeps feet dry, even while splashing around in sizable puddles. The shaft measures approximately 4.5" from arch and the heel measures approximately 1”, making this a slip-proof boot by any measure. Instead of the typical bungees this boot has a Ghillie lacing system that creates a customizable, secure fit worthy of adult standards. Then the abrasion-resistant toe cap and heel give added protection for bush whacking and those unexpected stumbles and tumbles. The nylon shank also lends an extra structure of support to twist prone-ankles and sensitive feet. The Timberland Kids' Mt. 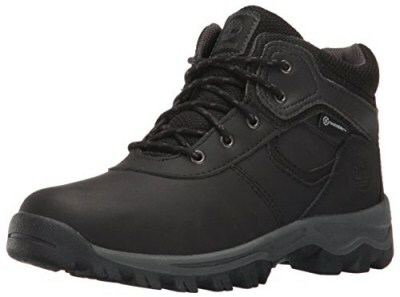 Maddsen Hiking Boot is made with premium full-grain waterproof leather upper. A waterproof membrane and gusseted tongue keep these kicks water tight and tough enough to stay dry in torrential downpour. Then, the B.S.F.P. Motion Efficiency System features lugs aligned along foot's pressure path to deliver improved traction and longer-wearing performance. It even has a padded tongue and ankle collar, because this tiny boot is all about comfort. An internal TPU shank provides torsional rigidity, and the Green Rubber outsole provides noteworthy traction. 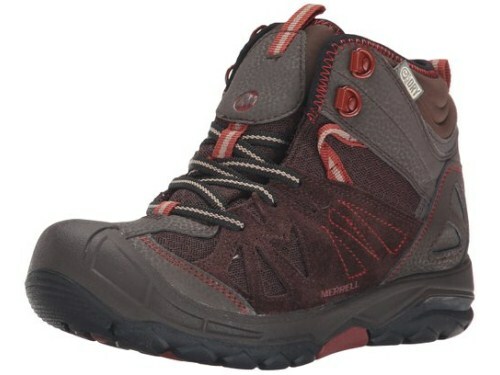 The Merrell Capra Mid Waterproof Hiking Boot is a leather and suede trekking shoe with mesh upper materials. It is an extremely customizable boot with its lace-up closure for snug fit and the bellow tongue helps keep pebbles and chunk of unsightly dirt out of the boot. The M-select dry, impermeable membrane, seals out rain but lets moisture escape so your little ones feet stay dry and significantly less sweaty. Additionally, the EVA removable footbed and M-select fresh naturally prevents odor and keeps those cute baby toes from smelling rank. The shaft measures at approximately 4.5" from the arch. Finally, the M-select grippy outsole boasts durable traction that grips when and where you need it. The North Face Kids' Jr Hedgehog Hiker is a mesh adventuring shoe with a PU coated leather upper for superior waterproofing without all that extra weight. It has a traditional lace-up closure for a snug fit and the CMEVA midsole absorbs impact on various terrain. Additionally, the padded tongue and collar makes breaking in this shoe a cinch. The UltrATAC non-marking rubber outsole act as a great bumper for when your micro adventurer accidentally bangs their feet against stumps and boulders. 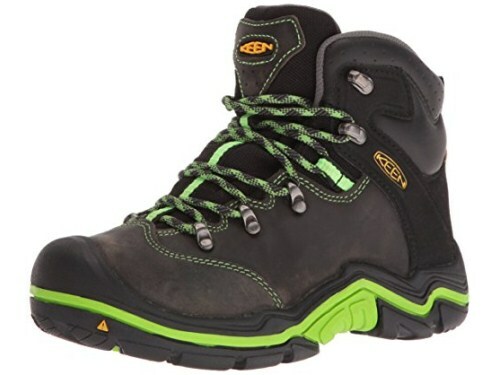 The Keen Torino Mid Top Waterproof Hiking Boot is a leather and synthetic trekking shoe with a breathable waterproof membrane that is perfectly suited for water filled adventures and multi-day treks. The shaft measures around 5" from the arch and a TPU shank combined with a grippy non marking rubber outsole offers optimal stability for all day rock climbing and trail running. Additionally, a customizable lacing system and cushioned tongue and collar make this mini trekking boot a snug, comfy fit. Lastly, the innovative CleanSport NXT keeps pesky bacteria at bay. The most stellar boys hiking boot for 2018 is… the Timberland Kids' Mt. 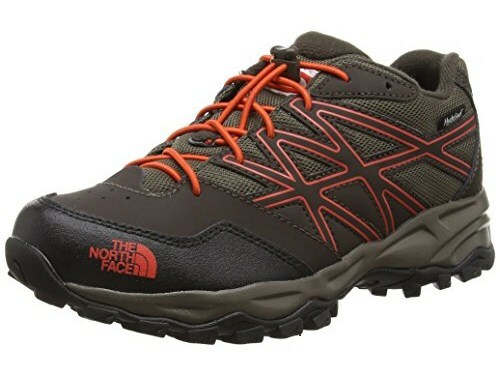 Maddsen Hiking Boot. It dominates for these reasons-- the anti-fatigue and adequate padding in every section of the boot will keep your little one from experiencing aching feet after a long day of adventuring. Also, the 4.5” arch and 1” heel will make it a challenge for your boy to slip and slide down a trail. Finally, the Ghillie lacing system keeps those darned laces locked in place so you can hike without stopping every ten minutes to re-tie fussy, loose laces, as opposed to the typical bungee laces tend to loosen rapidly over time. Whether you are retiring a pair of boots your kiddo has outgrown or are buying them their first hiking boots you can’t go wrong with any of these picks. At the end of the day, your kids' boots are your most important piece of hiking equipment and all the ramen, trail mix and gatorade in the world won’t make or break a trip like bad hiking boots will.